In this tutorial, we will learn how to develop a CRUD (Create, Read, Update, Delete) Web Application using Angular 7 as a front-end and Spring boot 2 restful API as a backend. You can download the source code of this tutorial from my GitHub repository at end of this tutorial. 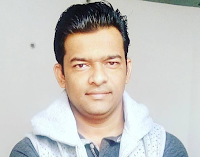 angular7-springboot-client: This project is used to develop single page application using Angular 7 as front-end technology. This Angular 7 application consumes CRUD Restful APIs developed and exposed by a springboot2-jpa-crud-example project. Let's first we will build a CRUD RESTFul APIs for a Simple Employee Management System using Spring Boot 2 JPA and MySQL. Later we will consume these Rest APIs using Angular 7 client application. Following are five REST APIs (Controller handler methods) are created for Employee resource. Configure application.properties to connect to your MySQL database. Let's open an application.properties file and add the following database configuration to it. Also, note that we have added MySQL dependency to pom.xml so spring boot will auto-configure all database related beans and configurations internally. This completes the development of Spring boot CRUD Rest APIs. Now we will develop client application using Angular 7. Let's develop a step by step CRUD (Create, Read, Update, Delete) Web Application using Angular 7 which consume above CRUD rest APIs. Good to know Angular 7 release notes and new features at Version 7 of Angular — CLI Prompts, Virtual Scroll, Drag and Drop and more. I assume that you have installed Node.js. Now, we need to check the Node.js and NPM versions. Open the terminal or Node command line then type this commands. Let's use below command to generate an Angular 7 Client application. We name this project as "angular7-springboot-client". We will use Bootstrap 4 for styling our application so let's integrate bootstrap 4 with Angular 7. This file Configures npm package dependencies that are available to all projects in the workspace. Note that angular version 7.2.0 in dependencies section in below file. As we already started Spring boot application. Now let's run this Angular 7 application. Added missing MySQL database configuration step. My suggestion is to clone source code from my GitHub repository. Excellent latest release of spring boot and angular 7 tutorial. Very informative article and very helpful. Thanks Ramesh. The codes found in your github (front and backend) are not working for me. Hi, what is the issue you are facing. Can you paste your error here so i that i will try to help you out. Thank you for your help! I'll send you an email with all the details and screens needed to describe the issues. Resolved [org.springframework.web.HttpRequestMethodNotSupportedException: Request method 'DELETE' not supported]. Can you check you were selected DELETE http method in Soap UI. There is no detail of the exception classes so it doesnt compile, could you post those files? I used your code structure without any change, I got this error. I killed the thread twice and again the same error I got.I think some connection issue may happen..
Verify the connector's configuration, identify and stop any process that's listening on port 8080, or configure this application to listen on another port. "Verify the connector's configuration" - I didn't get this. I am using default embedded tomcat port 8080. If you are getting error like - the port may already be in use means you have already running this or other spring boot application on 8080 port. Many peoples using this source code and find useful so i don't think any configuration missing here. Do you want to give any suggestion anything here? Backend is working fine now. cant get values from backend to frontend. Can you paste some details about the issue or error so that i can able to help you. message: "Http failure response for http://localhost:4200/api/employees: 404 Not Found"
message: "Http failure response for http://localhost:4200/api/emp/employees: 404 Not Found"
You are welcome. I am glad that my tutorials are useful to you.